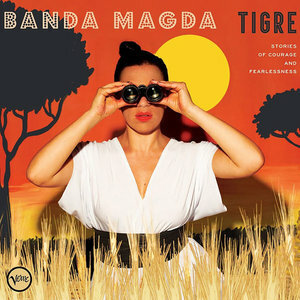 With a knack for aural fantasy, the genre benders of Banda Magda come into their own on Tigre. There has always been a strong sense of playfulness in the globally focused music of Banda Magda. Led by Greek-born singer and bandleader Magda Giannikou, the group has members from four continents and, like so many of today's leading transcontinental bands, has links to Snarky Puppy. While debut album Amour, t'es là went retro with cheeky chansons and sophomore work Yerakina brought us tight covers of international classics, though, new album Tigre has a timeless, reality-transcending vibe to it. Theatrical and multilingual, Tigre uses Banda Magda's unique sense of over-the-top color, broad set of cultural influences, and knack for aural fantasy to escape into vibrant melodrama. The lack of straight-up kitsch is refreshing. A Banda Magda live performance is always more fun for its winks to tackiness, but it doesn't always translate well into an entire album. As exaggerated as Tigre is, though, it never feels too garish or childlike. It isn't a disinterested kind of cool, either; it's an exciting album that requires some heartfelt engagement from an audience that isn't afraid to give it. To listen is to indulge and immerse yourself in story after story, to throw your head back to the exultant choruses of "Coração" and fall into the dreamy verses of Spinetta's classic "Muchacha (Ojos De Papel)". Banda Magda stomps its way forward with outrageous tango beats on "Venin", only to float out into the sunset with closing track "Thiamandi" and never look back. Only the attentive, the curious, the fun-loving need apply. Greek-language track "Ase Me Na Bo", heard in a previous version on Snarky Puppy's Family Dinner - Vol. 1, includes a refrain that translates, per Giannikou herself, as "Open your window and let me in / To light your dark seabed with stars / And make it shine turquoise." On Tigre, Banda Magda's light burns more brightly and with bolder colors than it ever has before, and does so on the band's own terms. The result is a delightful blend of the traditional and the totally new, a remarkably modern set of sounds brought to life by the group's love of music and utter joy in what it does. With heart, soul, and good, good feelings, Tigre marks the already outstanding genre-benders of Banda Magda truly coming into their own.